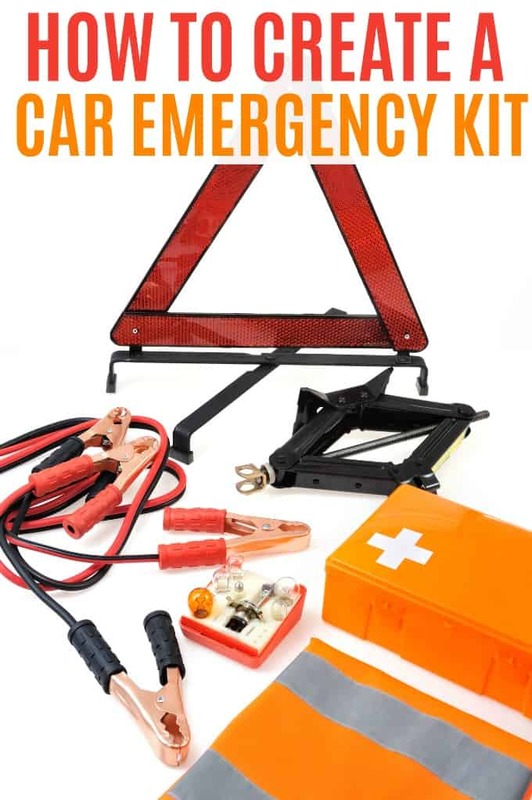 Sure, roadside assistance is a nice thing to have but in bad weather or if you’re off the beaten track and away from a cell tower when you run into car trouble, you need to have a car emergency kit at the ready. Understanding the basics of taking care of your car is essential to prevent problems, like running low on coolant or not even knowing how to open the hood of your car (trust me, I know someone like this!). Prevention is half the battle, but preparedness is the other half. Picture it: you’re driving along a side road on a blustery, winter day when you hit a patch of ice just slightly hidden by the blowing snow, spin off the road and right into the ditch. You’re at enough of an angle that there’s no way you’re backing out of that on your own, so you need help. What now? Or here’s another scenario: you’re parked on a downtown street, it’s very late and you’re battery is dead. What now? Where do you drive? Is it all highway or a lot of side roads? Is it in the city mostly? Do you often have other people in your car? Before you go a long distance in your car, make sure your tire pressure is okay and your windshield washer fluid is topped up. You should also check your oil and coolant levels. Most cars come equipped with a jack and a spare tire, but what else should you have in your trunk? What should you put in a basic car emergency kit? Bottled water and granola bars – if you are often driving other people in your car, make sure you have enough to go around! A blanket – just the standard kind, not the space age material kind! Emergency flares – there are newer LED models that are practical. A USB cable for charging your cell phone. A battery to go with the jumper cables. This can also help you recharge a phone. Tire inflator or tire sealant for fixing a flat. The deluxe first aid kit that has everything but the kitchen sink in it. Extra clothes and shoes. If you get soaked trying to fix your tire, you’ll want to be able to put on something dry. A tow rope or chain – if you go into a ditch, a friendly person in a pick up might be able to help you out long before roadside assistance can get to you! A small tool kit, including pliers, screwdriver, adjustable wrench. Depending on the time of year, you’ll need to add different items to your kit. When you go and change your tires from winter to summer and back again? That’s the time to change out your car emergency kit. With every switch, change out your water bottles. Some studies suggest that plastic water bottles left in hot cars will degrade over time, with chemicals leaching into the water. Better to be safe than sorry, right? Emergency blankets – this is where the space age material comes in handy! Sand, salt or cat litter: to give you traction if you slid off the road, with the added bonus that it puts weight on the back tires, which can help with traction in the winter. An extra pair of winter gloves. Driving a car is a responsibility, one that you shouldn’t take lightly. Part of that responsibility includes being prepared in the event of an accident or incident. You might also like how to keep your walkways clear of ice. Are there items that you have in your car emergency kit that we haven’t listed here? An important and informative post. In Germany it’s illegal not to have an emergency kit in the car at all times. Another good thing to have in the emergency kit is some sort of warning vest so that you can easily be seen. We have an emergency kit in every vehicle we drive. We also live in a snowy area and at times it isnt just a danger being stranded can be deadly. I have a lot of the same you have and a few other things too. We have been stuck and it isnt pleasant. This is a great list and I need to get busy on a kit for our van! Thank you so much for the tips and pointers on putting together an emergency kit from scratch. This will prove very helpful. Good list. I would also suggest adding a flint fire starter, flares, rope and finishing line (just in case you need it). I have some of these items in an emergency car kit but not all of them, like a whistle. Definitely a few I hadn’t thought of in this list. We hardly ever drive outside of the city but I know we should have some of these things anyway!